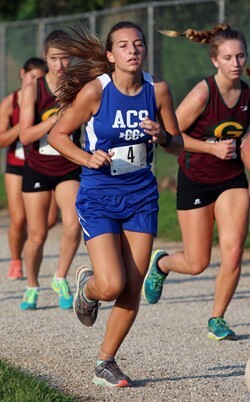 The Allen County-Scottsville cross country team competed Saturday afternoon at the Warren East Twilight Run at Ephram White Park in Bowling Green. Tad Koltin Taylor paced Patriot runners in the 5K with a time of 20:10.04. Taylor placed 49th in the field of 134 runners. The sophomore was the 13th quickest sophomore in the event. James Stanger finished 62nd in the field in a time of 20:44.07. Stanger was one of two seventh-graders in the varsity run. Patriot junior Conner Davenport posted a time of 24:31.16. In the high school girls division, sophomore Gabrielle Tangen led AC-S, placing 41st in the 86 runner field in the time of 25:45.97. Sophomore Sally McPherson recorded a time of 26:59.77. The high school cross country team is scheduled to participate on Thursday at the Barren County 3K run at the Barren County High School.